We found a house and now we are in the process of buying it. Our offer has been accepted. We close during World Fantasy. This is why I wanted this house. This would be the biggest, best kitchen I've ever cooked in. And amazingly, I found the house on Craig's List. That's wonderful. 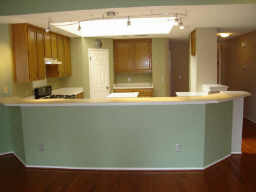 I know that the size of the kitchen was one of your major concerns from your last house hunting trip. Yoo-hoo! Congrats on the kitchen! So where are you going to be living during World Fantasy? Well, we close during World Fantasy, so the house won't be ours, exactly, until the funds clear or something. And then the moving thing. So after World Fantasy we go back to Ohio for about a week. I think. So technically during World Fantasy I still live in Ohio. I am totally envious of that kitchen. Mine still has most of its original wiring (original meaning 1930s vintage). Good work and congrats on the new home.